Peregrine typically machines pure beryllium material and beryllium alloys. 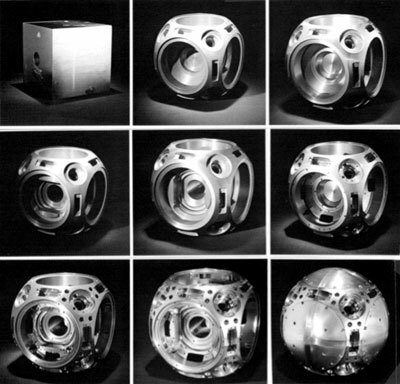 In particular to pure beryllium, machining techniques and processes are important in achieving a successful product. 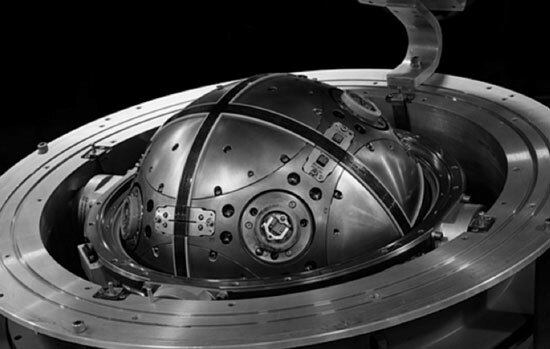 Beryllium is a fracture critical material and has a tendency to “twin” when a machine tool comes into contact with the surface of the material. Twinning is small micro cracks that develop on the surface due to the high stresses from the machining of this high modulus material. This damage is typically about half the depth of the machined layer removed. 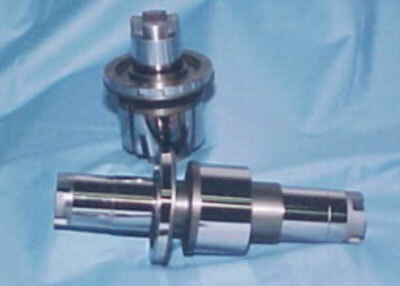 Therefore reiterative machining is necessary to manufacture a finished product from beryllium. Figure 2 below illustrates the number of steps, including stress relief, necessary to make a stable precision component from this material. As can be seen complicated and precise components can be produced. Typical steps in manufacturing usually include EDMing because of its low stress / non-twinning of the parent metal. It does leave a recast layer that requires removal. EDMing is a low stress way to remove a large amount of the material from the overall structure. After EDMing conventional CNC machining can be applied. The advantage that EDMing provides is that it circumvents the introduction of a lot of the induced stress due to the removal of nonessential materials. 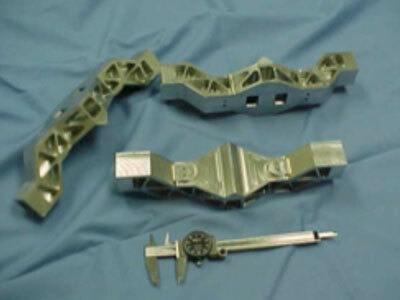 Without EDMing, large sections of material would require removal by conventional means; inducing substantial stress into the component; risking the potential of a crack developing. EDMing is an enabling process for beryllium, because it avoids beryllium’s fracture sensitive behavior. 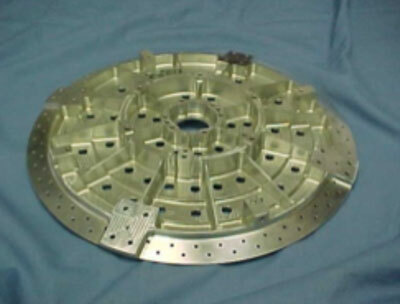 Reiterative machining is performed after EDMing with stress relief steps intertwined. Typically, conventional machine cut depths are taken at .020”, .010”, .005” and then .002” levels. These sequential cuts remove the previous cuts surface damage. This final cut of 0.002” leaves a damage layer of approximately .001” in depth on the final product. Chemical milling of 0.002” is performed to remove that damage. If high precision features are required thereafter, critical final lapping/grinding is performed in order to establish those features. Beryllium’s (and Be-38AL’s) fracture toughness value (K1c) is 9 ksi √in. The relationship between flaw sizes, fracture toughness and maximum stress are well understood for beryllium and designs are produced accordingly. However, beryllium is unique from a fracture mechanics point of view because of its sensitivity to twinning during manufacturing and the need to screen for flaws large enough to be a contributing factor to the end components quality. This drives components made from this material into an engineered product category. There is substantial effort by manufacturing and quality engineering that goes into a successful beryllium component. NDE methods of dye penetrant, ultrasonic and radiographic inspections along with performance tests are utilized in order to verify the homogeneity of the finished component. Beryllium can be plated and finished and high quality companies are usually sought out to handle these critical finishing operations due to the invested product cost at that point. Figure 2 above is typical of the operations necessary for a high quality component. Beryllium is typically selected for its high precision elastic limit, high modulus, low weight, moderate CTE and good thermal performance. Structures, optics, and pointing systems have typically been made from beryllium and beryllium alloys.